The Earth is called "the water planet" because it has approximately 14,108 cubic kilometers of water. However, 97.5% of this water exists in the seas, and nearly all of the remaining fresh water is locked up in the Antarctic or Arctic ice caps or as groundwater. Therefore, we can freely access only the water in lakes (0.007%) in rivers (0.002%). Of these, lakes are the best "available freshwater source on the Earth's surface." Lakes are valued as water sources and for fishing, water transport, recreation, and tourism. Water use in Japan is distributed for household use (18.4%), industrial use (17.4%), and agricultural use (64.1%). Lakes are a vital source of water for all of these uses. Kasumigaura Lake can provide 61.45 tons of water per second. This water is divided among agricultural use (82.7%), industrial use (13.3%), and public water supply (3.8%); domestic water is supplied to Ibaraki, Chiba, and Tokyo Prefectures. Water from Biwa Lake meets the drinking water needs of 14 million people in Shiga, Kyoto, Osaka, and Hyogo prefectures. The history of Manno-ike Reservoir (Kagawa Pref. ), as an agricultural reservoir, dates back to the Taiho period (701 AD to 704 AD). Lake water is also invaluable as a source for hydroelectric power generation. Hydroelectric power accounts for about ten percent of generated power in Japan, nearly all the water for which comes from artificial and natural lakes. Brackish water lakes that connect to the sea have large fish harvests: Shinji Lake with 9.971 tons (mainly corbicula shellfish and freshwater smelt), Hachiro Reservoir with 8,419 tons, and Ogawara Lake with 6,241 tons. Kasumigaura Lake cultivates 5,471 tons of carp. 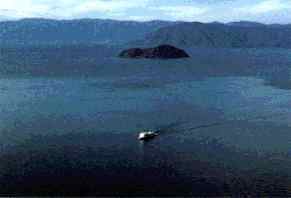 With 3,326 tons of fish, Biwa Lake has the highest fish harvest among freshwater lakes. 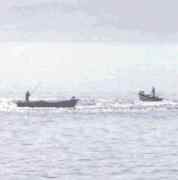 Lakes support a number of fishing industry businesses: Biwa Lake has 1,045 businesses and Kasumigaura Lake (Kitaura included) has 759 businesses. Moreover, freshwater smelt and crucian carp are released into numerous lakes, e.g., the Sagami Reservoir, for tourist fishing. People feel relaxed around water as symbolized by the expression "water and greenery." People use lakeshores for talking walks and other recreation and sports activities such as boating and fishing. The annual number of tourists visiting lakes has risen: 37.5 million for Biwa Lake, 21.3 million for Ashinoko Lake, 7.87 million for Toya Lake, 6.44 million for Kawaguchi Lake (16 million to all the Mount Fuji lakes [Fuji-goko Lakes]), 4.66 million for Chuzenji Lake, 3.9 million for Yamanaka Lake, 2.72 for O-numa Lake, and 2.56 million to Shikotsu Lake. Many people also visit dam reservoirs near major cities and tourist spots: 1.59 million for Gose Reservoir (Iwate Pref.) and 1.44 million for Kamafusa Reservoir (Miyagi Pref.). 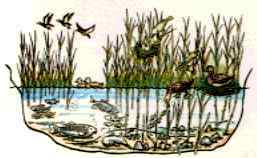 In general, lagoon-type lakes accommodate a variety of fish species because both brackish-water fish and coastal fish live in them. Shinji Lake is home to 59 species of fish (including both brackish-water and coastal fish) and Hi-numa Lake is home to 52 species (including both brackish-water and coastal fish). With four million years of history, Biwa Lake is inhabited by some 52 species of freshwater fish (12 indigenous species) and 46 species of shellfish species (20 indigenous species). Lakes are not homes just for fish but also for waterfowl and many other life forms. Notably in the case of migratory birds, if one habitat deteriorates, the ecosystem in the destination country is affected as well. Japan has signed the Ramsar Convention for the protection of wetland and lake ecosystems, and nine locations in Japan, including the Kushiro Wetlands and Biwa Lake, have been registered as internationally important wetland or lake ecosystems. According to calculations, Biwa Lake protects some 7.8 million people and 50 trillion yen (approx. US$50 billion) worth of assets from flooding by acting as a flood control. Watarase Reservoir (Gunma Pref.) 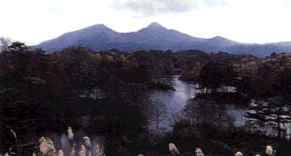 is presently used as a flood control pond although it was originally built as a mine pollution sedimentation pond for the Asio Copper Mine. The wetlands that have spread out near Yanaka Reservoir have become a paradise for wildfowl outside of the flooding season.